We don’t have an on-line ordering facility as we usually make to order. Ordering and enquiring is very simple though…. just click on one of the email links you’ll see throughout the website and send us a short message with your requirements, or call Alison on 01294 829012, whether you simply want to order a basket as seen on the website or have something custom made. When we’re making custom made items we aim to get as close as we can to the measurements given without exceeding them – that way your baskets will always fit! When working out the size you’ll need, we suggest allowing 2cm clearance on the width. The height and depth is up to you, but for the height at least 1cm and possibly 1cm on the depth (if you want the option of having the baskets sit back a little from the front edge). Alternatively You can give us the space measurements and we’ll deduct the clearances. 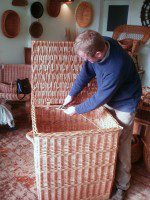 Because we make everything to order, if you would like your storage baskets, shopping, washing, linen, storage or log basket slightly smaller or larger or a different colour, it’s no problem at all. We love that we’re making the baskets especially for you – not just getting them out of the stock room! If you wish to discuss your requirements and need some help with size or specifications, please email Alison or call on 01294 829012, and we’ll take it from there. If you are in the vicinity, why not call into the Workshop in West Kilbride where you can see baskets being made and place your order. 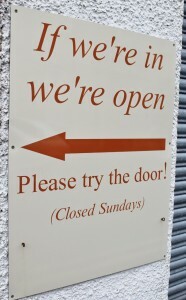 The workshop is open most days – usually Monday to Friday 9 – 5 and Saturdays, but best to call in advance if you’re planning a visit as we are not always there. If you get the answer machine when you call, please try the mobile 0777 603 3129. The parcels weighing more than 2kg can either be sent via MyHermes for £7.50 with an overnight carrier APC. For most addresses in mainland UK, individual items via the overnight carrier cost £11.00. Larger items or orders for larger quantities may cost more. The delivery cost will be calculated and advised at the outset. We accept payment by cheque, bank transfer (via internet or telephone banking), PayPal or you can pay with a credit or debit card, via PayPal. We take cash and cheques in the shop. We generally don’t take deposits, but ask for full payment before despatch.